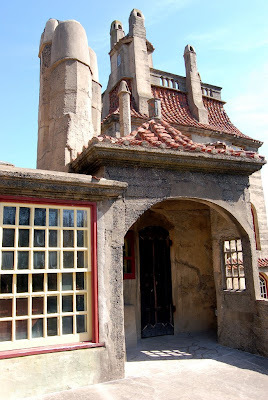 Last week I wrote about Mercer Tiles (read the post HERE) and thought I would share a bit about Fonthill, the home of Henry Mercer (renaissance man!). 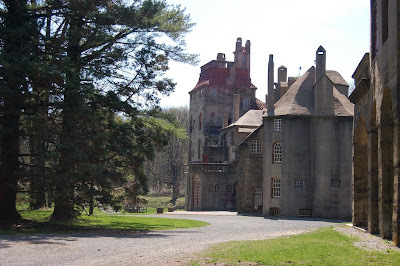 Fonthill was built between 1908 and 1912 as a realization of Mercer's dream. It took 8 workers and a horse named Lucy to finish the house of reinforced concrete. You can see the arts & crafts movement very strongly in the design. It is stepping away from industrialization and towards a simpler time when everything was made by hand. If you came upon this house, you would think you had stepped into the english countryside and found a home that was built and added upon for generations. It has 44 rooms, 18 fireplaces, 32 stairwells and over 200 windows; Big dream house! As it is concrete in a far from friendly climate, you can see the patchwork that is neccesary to keep the house in one piece due to the freeze and thaw cycles; I think this just adds to the charm though. 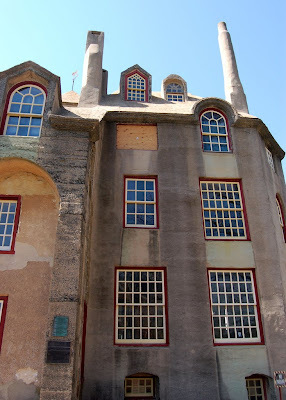 I love the red painted window frames, don't you? They add so much! If you were to build your dream house, what would it look like, like Fonthill perhaps? Visit Fonthill's official website HERE. love films with the country house/ mansion vibe: Gosford Park, Règle du jeu La, Last Year in Marienbad. spend time watching movies? suggestions? I love your posts about unique and beautiful homes. That is one amazing house. I have to think for a while about mu dream house. It would be a long answer. This is the coolest house I’ve seen in a long time! I designed my dream house with the help of a company called Taylor Morrison and I’m very happy in it but man, this house gives me some ideas for renovations. I really recommend Taylor Morrison to anyone who is interested in making their dream house a reality. They were really great and helped me with every step of the process, and if you request information from their webpage (http://dreambig.taylormorrison.com/?utm_source=bc) you’ll be entered into a contest to win a dream vacation. After seeing these pictures I think my dream vacation would be a castle – thanks! Love to go there and visit. Where do you find all these interesting oddities! I think my dream house would be that of the seven dwarfs, tucked in the forest. A great artist retreat, with creatures around me to tidy up when Snow White waltzes in the door. The seven dwarfs would keep me company and say kind things to me about me work. I think it would be fun to live in a house by Hundertwasser with not a single straight wall and painted all over in smarty colours - LOL. What a beautiful house! I love the Arts & Crafts Movement. Regarding my dreamhouse, that's a question that I'd likely answer differently from one day to the next. Today I'd choose The Red House, which was designed for William Morris. 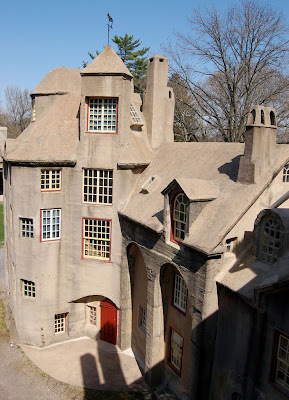 I am dying to go to Fonthill. Martha Stewart had a nice spread on the house in a recent issue (can't remember which one off the top of my head, but I can try to find it if you want) and there were tons of great images of the interior. I left the house thinking that as long as someone gave me enough money, I could build a house to honor whatever wack-o ideas I had. In the 70's I saw some "art" which was a baby doll wrapped in barbed wire and submursed in jello. The chicken wire that was used to hold up the miscellaneous items on the wall made me wonder if that was the precursor to the babydoll-wire-jello. wow, that looks so much like a crazy old Scottish baronial pile, one of those buildings that grew organically from a simple tower house to a rambling 18th-century estate... like Traquair or Blair Castle. Love it! Wow, 44 rooms - how many cleaners have to be there to keep the place tidy? Opulently I to but I about the brief should acquire more info then it has. Can it be that he named it after Fonthill Abbey, the large gothic revival house of William Beckford ? Nice house. Looks like a mini castle to me. This is an absolute stunner. However it is too huge a dream house for any laymen out there like me especially if we only have a small family. Nonetheless, it is indeed a DREAM house and we have always been told to dream BIG. That aside, I really love the countryside aura that such an English concept house gives off. It most certainly feels so welcoming and homely to be at such a place. One thing for sure with a mansion this massive, I am sure Mr Mercer does not have any issue with storage to store all his possessions. Harbor Hill - new blog header! In the Pittsburgh Post Gazette!